Tui Na is an ancient form of Chinese massage therapy, according to unearthed evidence of archaeological studies, Tui Na can be dated back to around 2700 BC. Tui Na is based on the theory of traditional Chinese medicine, such as the theory of Yin and Yang, Five Elements, Zang-Fu organs, meridians, qi, blood and body fluids. Among others, the theory of meridians and acupoints are of great importance in Tui Na therapy. Tui Na covers a wide range of indications and disorders, such as vertigo, common cold, headache, insomnia, cough, asthma, stiff neck, frozen shoulder, degenerative disc disease, sciatica, constipation, dysmenorrhea and some other illnesses. Acupuncture is a component of the health care system of China that can be traced back at least 2,500 years. The general theory of acupuncture is based on meridians and acupoints. The practice of acupuncture to treat identifiable pathophysiological (disease) conditions in North American was rare until the visit of President Richard M. Nixon to China in 1972. Since that time, there has been an explosion of interest in North America. Acupuncture is a family of procedures involving stimulation of anatomical locations on or in the skin by a variety of techniques. The most thoroughly studied mechanism of stimulation of acupuncture points employs penetration of the skin by thin, solid, metallic needles, which are manipulated manually or by electrical stimulation. 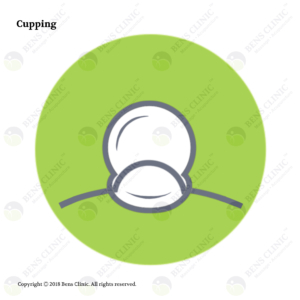 Therapeutic cupping is a simple suction technique used all over the world. By creating suction and negative pressure, cupping therapy lifts connective tissue, releases rigid tissue and loosens adhesions. Cupping pulls stagnation, waste, and toxins to the skin level where it can be easily flushed out by the lymphatic and circulatory system. This allows new oxygenated blood to flow into the area and bring nutrients to the area to promote healing. In Gua Sha treatment, a therapist scrapes your skin with short or long strokes to stimulate microcirculation of the soft tissue, which increases blood flow. The therapist applies massage oil to your skin, and then uses a smooth-edged tool to repeatedly scrape your skin in a downward motion. Inflammation is the underlying cause of several conditions associated with chronic pain. Scraping the skin’s surface is thought to help break up stagnation, reduce inflammation, and promote healing.